Shore Lunch breading/batter mixes are shere the journey to outdoor flavor begins. 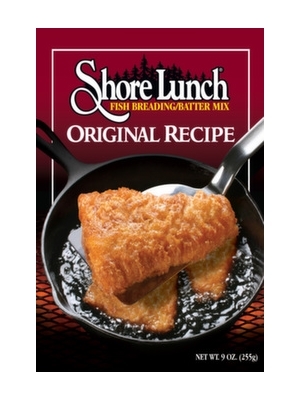 Imitated, but never duplicated, Shore Lunch Original Recipe Breading will make you fish crisp, flakey, golden and delicious. Bleached enriched wheat flour (wheat flour, niacin, reduced iron, thiamine mononitrate, riboflavin, folic acid), partially hydrogenated soybean and/or cottonseed oil, salt, leavening (sodium bicarbonate, sodium aluminum phosphate, monocalcium phosphate), dried whey, garlic powder, sugar, buttermilk solids, monosodium glutamate, potato flour, onion powder, spices, dextrose, natural flavor, corn starch, hydrolyzed soy protein, extractives of paprika.